Review: Kamijyo Touma lives in the Academy City, a special advanced city cramped with all sorts of schools and mostly populated by students. Through scientific means, students there are able to obtain and train their special superhuman esper-abilities. Touma seems to have no talent whatsoever as an esper, but in a fight he realizes his right hand can nullify any kind of esper attack. It’s a very rare ability, but maybe his hands repelling all good luck is the reason he always gets himself into trouble. 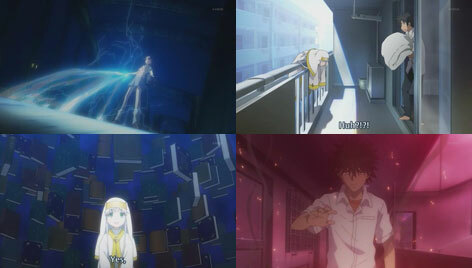 Just recently he found a strange girl called Index sleeping on his balcony; and that’s where the real trouble starts. The animation quality is pretty good and similar to Shakugan no Shana. The story is set in an interesting near future Japan I think. As the plot goes on more and more shocking truths are uncovered and it never leaves you bored. Shakugan no Shana fans and anime fans who like sci-fi and action should definitely give this anime a try. Compared to the previous anime in the list, this one is the best ever(for boys). i would give it 10/10. Fun Anime They made a side story anime after this called a certain scientific railgun which was also a lot of fun to watch!